BETTING INVESTMENTS LIMITED is a recently formed limited company and is a registered entity in the United Kingdom in late 2013 has registration number Company No. 08774926. Behind this recent formation, is a rich history of success. The experience of our company goes way back a couple of years ago. Our company is engaged in in-depth analysis and the development of strategies betting on sporting events. Our team of professionals has formed a very highly profitable business schemes with minimal risk that was the start of an investment project in the network and attractive favorable conditions for investors. 04.28.15 11:02	Account	Transfer	-70.00	Sent Payment: 70.00 USD to account U8700135 from U4731311. Batch: 88122198. Memo: Shopping Cart Payment. 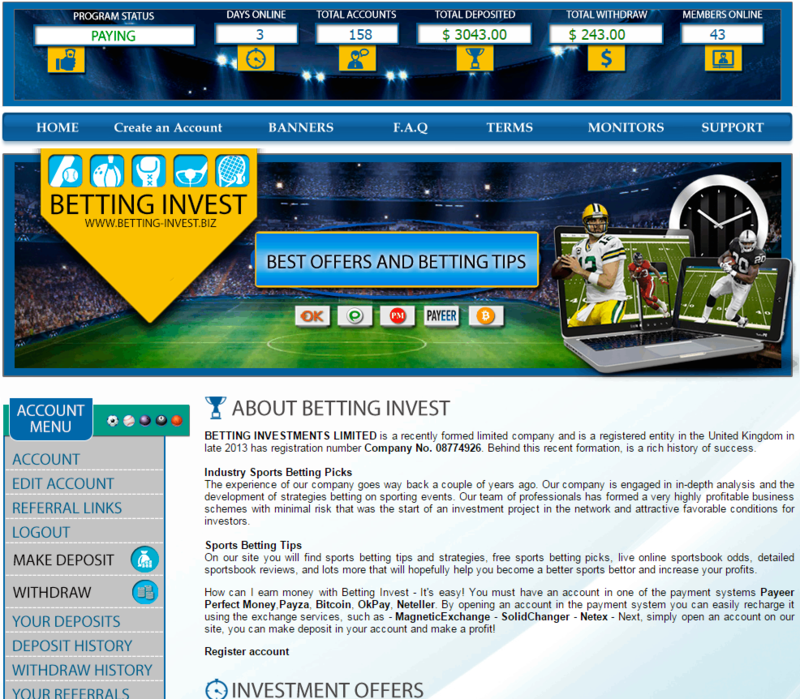 Deposit to betting-invest.biz User monitor-invest.net. 04.29.15 14:10	Account	Receive	+1.4	Received Payment 1.4 USD from account U8700135 to account U4731311. Batch: 88217524. Memo: API Payment. Withdraw to monitor-invest.net from betting-invest.biz. 05.01.15 19:59	Account	Receive	+1.4	Received Payment 1.4 USD from account U8700135 to account U4731311. Batch: 88562150. Memo: API Payment. Withdraw to monitor-invest.net from betting-invest.biz. 05.02.15 10:45	Account	Receive	+1.2	Received Payment 1.2 USD from account U8700135 to account U4731311. Batch: 88599546. Memo: API Payment. Withdraw to monitor-invest.net from betting-invest.biz. 05.03.15 10:53	Account	Receive	+1.4	Received Payment 1.4 USD from account U8700135 to account U4731311. Batch: 88660054. Memo: API Payment. Withdraw to monitor-invest.net from betting-invest.biz. 05.04.15 18:54	Account	Receive	+1.8	Received Payment 1.8 USD from account U8700135 to account U4731311. Batch: 88765923. Memo: API Payment. Withdraw to monitor-invest.net from betting-invest.biz.